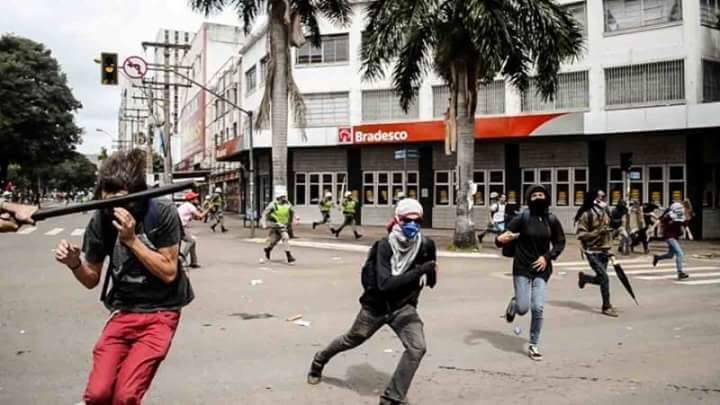 A 33 year old student is in a coma after he was hit on his head with a police baton during yesterdays general strike in Brazil. More than 35 million people took part in the general strike. In many cities clashes broke out after riot cops attacked protesters. Amid record levels of unemployment and a terribly unpopular government, unions and citizens from all walks of life took part in one of Brazil’s biggest ever strikes. Anarchists supported yesterdays general strike. In Goiás 33 year old student Matheus Ferrera da Silva was hit on his head with a baton by a paramilitary cop (pictures) . He is in a coma after the vicious police attack. The assault was spotted by journalist Luiz da Luz. Da Luz wrote that the cops turned away without helping the injured student when he was lying on the ground. According to a statement by HUGO (Emergency Hospital of Goiás) Matheus suffered traumatic brain injury and multiple fractures and is still in a coma at the intesive care unit of the hospital. More than 35 million people in Brazil took part in yesterdays general strike. In one of biggest general strikes in the country’s history against President Michel Temer’s neoliberal reforms, activists brought the country to a standstill. Clashes broke out after riot cops and paramilitary police forces attacked protesters in several cities. In Rio de Janeiro cops were seen firing tear gas to disperse protesters in the early morning hours, many people were detained. Similar scenes were also seen further South in Santos, where police reportedly used tear gas in an attempt to clear roads leading to the city’s port. In Rio de Janeiro, the bridge between Rio de Janeiro and its neighboring city of Niterói was blocked by protesters for a number of hours in the morning. Large protests also took place in Sao Paulo, in the Salvador the capital of the eastern state of Bahia, in Curitiba in the southern state of Paraná and Belo Horizonte, the capital of Minas Gerais. In Porto Alegre, police also fired tear gas and smoke from burning barricades on the streets billowed into air. Banks, schools and transport were brought to a halt in Florianopolis, Santa Catarina as cops surrounded the crowds that took the streets. In many more cities people had setup road blockades, burned tires in the streets, and protested against the unelected government and its neoliberal labor reforms and austerity programs, with many holding signs of “Fora Temer!” (Temer Out!). Several buses were torched during yesterdays clashes. Banks and other corporations were also attacked. The strike was called immediately after Temer’s administration pushed through a controversial labor reform bill on Wednesday in Brazil’s chamber of deputies. The labor reform will undermine workers’ rights by eliminating payment for their commute from their contracts, reducing compensation for employer abuse, and will allow employers to reduce workers’ salaries while increasing their work hours. The bill, which also proposes to end mandatory union dues, must still be approved by the Senate. It was approved by Brazil’s lower house by 296 votes to 177. Temer also proposed a 20-year freeze on public spending and pension cuts.